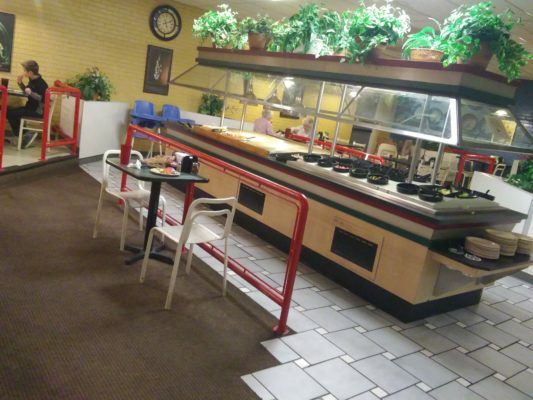 Pizza buffets, God love ‘em, are almost always the worst. So many of the times I’ve visited them, the stainless-steel trappings are a marinara-soaked wasteland where chefs send their worst pizzas out to die, typically opting for lesser spices and even lesser sauces to make a quick buck on people who simply cannot control their basest of pizza cravings. 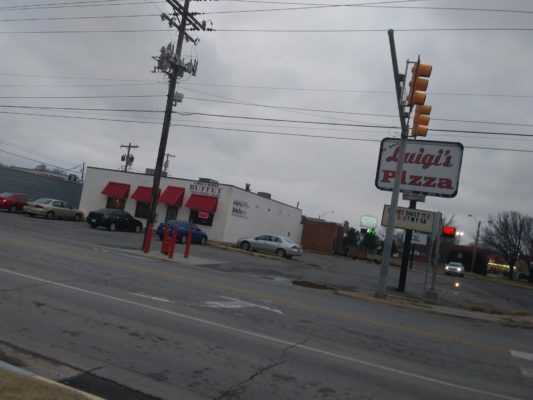 But, you know, I’m a good soldier and, under orders from Patrick, an admitted fan of their carry out specials, I went and tried out Luigi’s Pizza, 7901 North May Ave., last Friday night. And besides—at a price of $6.99, even if the whole thing was a bomb, at least I’m only out $6.99 and maybe just a little self-respect. 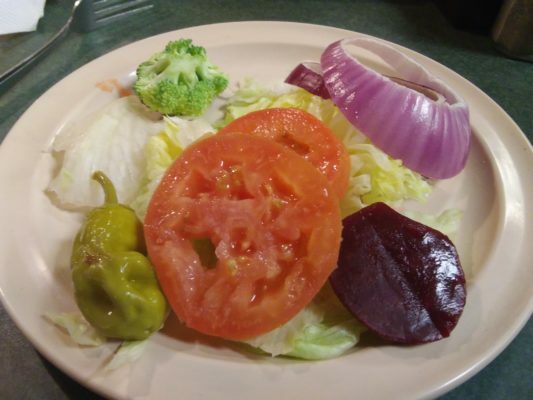 Grabbing a plate from the large warm stack, I decided to start off with a salad; I hate to say it, but the salad bar was completely mediocre, basically just iceberg lettuce and about four or five varieties of creamy dressings. Thankfully, I was able to add on enough solid onions, saggy tomatoes and sliced beets for something of a somewhat healthy number. Looking around the room though, I’m not going to give Luigi’s too much grief for the sparseness of their greens—not to be too presumptuous, but this is sadly some of the only salad some of these people will ever eat on their own accord. So good on Luigi’s for at least providing this healthful attempt at culinary diversity, no matter how wilting. There were about two or three pizzas laid out on the large buffet at this point; maybe they’re waiting until the room gets a bit more crowded before they set out the extravaganza, right? No matter, with the provided tongs, I quietly grabbed individual slices of pepperoni, sausage and hamburger, the only pizza choices available, but solid ones nevertheless. Regardless of choice (or the lack thereof), this really was some on-the-mark pizza; the thin crust on the pepperoni was buttery with a great cache of cheese and pepp, while the toppings on the hamburger seems to be literal slices of ham and burger. The sausage was more of the same, featuring fat pockets of grease burying the thick nubs of sausage deep. 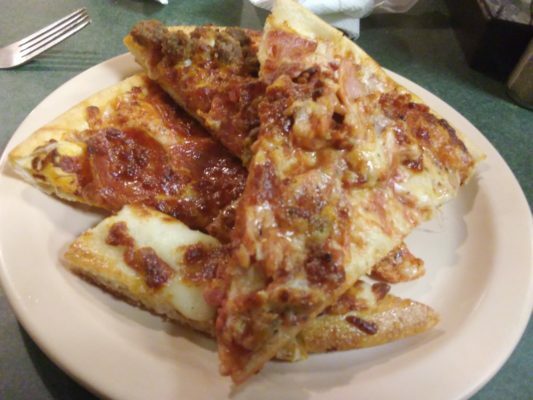 I gotta say: despite having the most stereotypical pizza-place name on the planet, Luigi’s Pizza, admittedly, does a good job of serving fat slices of wholly traditional pie, which is really the only job a pizza buffet has to accomplish in life. But that wasn’t all, was it? Usually, every pizza buffet has a couple of square side items to make people happy, here being the spaghetti and no meatballs with canned marinara—although they do use their own secret blend of spices, I was told, but didn’t try. And, of course, the quintessential dessert pizza, an apple-cinnamon treat that I just had to say no to, knowing full-well that an achingly sweet bite is just a little too much on this already full day. Even though I remember the building being home to a rather sub-par Pizza Inn for years, Luigi’s Pizza has apparently been around for quite a while which, in this world of $5 corporate buffets that threaten to knock Mom and Pop pizzerias out, it’s good to see the little guy, covered in flour and sauce, succeed for once or, at least, Tuesday, Wednesday, Friday and Saturday from five to eight. Cómpralo ya! Previous post KFOR names Mason Dunn as new chopper pilot! Before I changed my diet that was one of my go-to lunch buffets. Great cheap pizza and he always keeps them coming, at lunch at least. 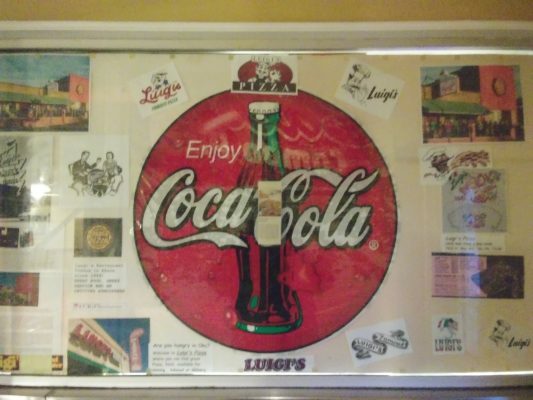 There are definitely better pizza places in town, but it’s hard to top the A) price and B) nostalgia value of Luigi’s. Their thin crust pies are virtually identical to the cheap Pizza Inn pizza I grew up eating in the early to mid 1990s. They use the same magical thin crust, and the same rich and tangy red sauce. The smell of their pies alone makes me want to watch TGIF. I have been curious about this place before but never ventured inside. It is a fantastic cheap lunch. The service is good too, even at lunch rush. Although this was about Luigi’s, this article generated an immediate flashback to my only visit to Hide Away…call it what you want…it ain’t pizza. Not now, Louis. Can’t you see we’re on a roll ranting against MAGA, greedy corporations and DERPLAHOMANS!? I ate there several times when it was pizza inn. Fast, cheap, blah. Sub par Pizza Inn? Surely you jest. I grew up in the neighborhood there and spent many evenings there playing video games and eating pie while my older brother worked his shift. New York style pizza, excellent Dr Pepper on tap. What’s not to like? Great ownership, great pizza. Need to get back over there. Ben, you don’t know what you’re talking about! New York style pizza is supposed to be a soft thin crust! This is a thick crust! Barrett, it is NOT a thick crust! The NY Style is a MEDIUM crust. It’s also delicious. But since we’re talking about pizza, I knew a guy who would eat TWO full medium thin crust pepperoni pizzas at a single sitting at the buffet. Try doing that with the NY Style or Pan Pizza! Barrett, you can’t! That’s what it was called barrett! New york style! I’m not here to say if it was authentic New York style or not, im just saying it was good pizza! You wouldn’t know good pizza if someone shoved it in your face! I am in Edmond and always willing to try new places since I rarely cook at home. I eat out pretty much daily, since I have zero cooking skills beyond my electric smoker on the deck. Big macs and Taco Bell have become old news to me. I’ve tried several new places in Edmond, both have been in Edmond in the same strip mall. Just west of 2nd and Frets street on the south side. First had a sign outside stating “Mexican fast food”. Appears to be a mom/pop place that would have great food.But once I got inside and looked at the menu board above the counter, there was nothing at all in English. Nothing. I struggled with this for a few minutes before feeling unwelcome and leaving ,and going next door west to a place called Po Boy and Catfish . Great catfish and sides. The Cole Slaw seems to be made fresh, not just scooped out of a 5 gallon bucket from Sams Club.I have been back there several times. Just remember to ad $1 to the menu price if that’s an issue. They will always have an excuse for it. What in the world is this nonsense!!!! We’re talking PIZZA – not catfish!!!! It’s a restaurant review. I offered some of my experience. Get over it and move on. Bill, you hiacked this thread to talk about catfish for some reason. This is a thread about PIZZA!!! Come on – you’re better than that. I came here to talk NW OKC establishments, NOT Edmond! The Pizza Inn sign was hit by an F1 tornado on 10/2/1986 and it has stood tall ever since despite that storm’s efforts! It also withstood the 6/13/1998 tornado, it’s neighbors were not as fortunate. That system nearly took out the Channel 5 team and Saturday night Frontier City thrill seekers. If you’re looking to unwind after your pizza buffet, look no further than Club Wilshire which is 50 yards to the west. Entrance is in the back but the party is all around.